Explore the extremes in books and prints at the Jaffe Collection in this exhibition focused on scale. We’ve paired our largest book (a surprisingly graceful and fluid book made of Plexiglas, wood, and metal by Marilyn Goodrich and Daniel Kelm) with one of our smallest by Peter and Donna Thomas; our largest print (a monumental woodcut by Leonard Baskin) with the newest additions to the Jaffe Collection (a series of Tiny Prints by Mandolin Brassaw of Grapheme Seattle). We’ll focus on place, time, flora and fauna, classics and fairy tales… and we’ve got our tiniest book on exhibit, too: a one-of-a-kind book of watercolor flowers painted in Tokyo in 1948, which folds down to a diminutive 2 x 3 centimeters. This exhibition of prints and books in size extremes includes the works of Jim Dine, Timothy Ely, Barbara Brandt, Berwyn Hung, Paul Johnson, Karen Hanmer, the Cranach Press, Matthew Reinhart, Ed Hutchins, Brother Arnold Hadd of the Shaker Press, Claire Jeannine Satin, Sarah Vogell and Shawn Sheehy, John Cutrone and Seth Thompson, Victoria Thur, Werner Pfeiffer, Mare Blocker, Heidi Neilson, Leonard Baskin, Peter and Donna Thomas, Mandolin Brassaw, the Whittington Press, Warja Lavater, Louise Silk, Jill Timm, Jan and Jarmila Sobota, and more. This exhibition actually began as a small works show, but we soon discovered that small works, on their own, are not that interesting. They become really fascinating, though, when viewed in the context of larger works (like this exploded flag book titled “Tacky Churches” by Sam Minor and K. Nelson Harper). The Jaffe Collection’s largest book is this piece, Book of the Red Night, by Marilynn Goodrich, bound by Daniel Kelm. It stands about 4 feet tall, with pages made of Plexiglas. The two small specks on the white shelf beneath it are two of our smallest: “Rags” by Peter and Donna Thomas (about 2 inches tall) and a book pin with turning pages by Claire Satin. Half of this exhibition is located in the lobby outside the Jaffe Center. This portion of the exhibition is accessible during regular library hours, which are Monday to Thursday 7:40 AM to 2 AM, Friday 7:40 AM to 6 PM, Saturday 10:30 AM to 6 PM, and Sunday noon to 2 AM. 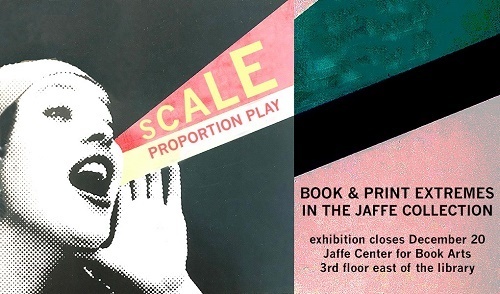 The portion of the exhibition installed inside the Jaffe Center for Book Arts may be viewed Monday to Friday, 10 AM to 4 PM, and during special events when the Jaffe Center is open on evenings and weekends. The Wimberly Library will be closed for Thanksgiving November 22 and 23, with reduced hours on November 21. View hours each day at the library's home page: www.fau.edu/library. The brand new I-95 interchange for Florida Atlantic University (Exit 48A) takes you directly from the interstate to FAU. Mind your speed: the exit ramp speed limit is posted at 30 MPH, and FHP are enforcing this strictly. Once you pass the traffic light at Spanish River Boulevard, you are on the FAU campus on FAU Boulevard. Continue to the traffic signal at the intersection of FAU Boulevard and University Drive (FAU Stadium will be on your right). Turn right onto University Drive. Turn left at the traffic signal at Volusia Street. You will see a parking garage on Volusia Street, and the Wimberly Library is the next building east of the parking garage.